This article may contain outdated information that is inaccurate for the current version of the game. It was last updated for 1.23. Please help improve this article or section by expanding it with: Expel minority mechanics. As EU4 starts during the age of discovery, Colonization is an important feature available. Nations can explore and colonize the continents of the Americas (or a Random New World with Conquest of Paradise enabled), Asia, Africa and Australia, as well as Siberia and islands in the Pacific. The main benefit of colonialism is to improve the income generation and military logistics of the colonizing country. This is because colonized territories overseas can provide large boosts in trade income to the colonizing nation, as well as provide staging points for naval and land warfare around the world. This is accomplished primarily by creating colonial nations, which are AI-controlled subject nations that will produce their own military and navy but will provide trade power and other benefits to the colonizer, and creating trade companies, which are semi-autonomous provinces that provide substantial trade bonuses in trade nodes that the colonizer can control. The type of subject nation created depends on its location in the world. Any nation can benefit fully from overseas territories, even very distant ones, if they choose to make that territory into a state. However, provinces in overseas colonial regions should not be made into states, as the provinces are eventually ceded to the new colonial nation. Western technology nations will most likely prefer to make trade company provinces if possible instead of creating new overseas states, due to the bonus trade power and the ability to ignore religious differences. However, for many other nations, overseas states can sometimes be very profitable. A special case is Russia with the Third Rome DLC, who can establish certain colonies without a colonist. Overseas provinces can be used to build ships. They give you half of their trade power. Large (more than 10 provinces) colonial nations give 5% global trade power and +5 land force limit and +10 naval force limit to their overlord. Large (more than 10 provinces) colonial nations give +1 merchant. Colonial nations speed up colonizing by using their own colonists: one from their national ideas, and they tend to take Expansion ideas, which give them two more. Subject colonial nations join overlord's wars (though they tend not to help much). When strong enough, they can autonomously declare and fight colonial wars against primitives and foreign colonial nations. This section may contain outdated information that is inaccurate for the current version of the game. The last version it was verified as up to date for was 1.27. Although some uncolonized provinces may be visible at the beginning of the game, much of both land and water is covered by terra incognita. Discovering these areas is essential to finding provinces to colonize. A conquistador is required to explore on land (unless the country is at war; see below), and an explorer is required to explore at sea. These are special military leaders that are given pips as though the country had 80% as much tradition as it really does, in exchange for being able to explore. The “Quest for the New World” idea, the first idea in the Exploration idea group, is required to hire explorers and conquistadors. A handful of countries (notably Portugal) have an explorer in 1444 despite not having the idea; these leaders cannot explore in ocean provinces until Quest for the New World is unlocked. Norway's second national idea “Call of Our Forefathers” also allows the recruitment of explorers and conquistadors and allows them to explore. This is the only other way to explore without taking Exploration ideas. While at war, armies can enter all enemy provinces, even those hidden by terra incognita, assuming movement isn't blocked by forts or blockades. This can be done by clicking to move the army into a suspected province within the terra incognita; the army will begin to move regardless of whether they are able to complete the move. Movement into the province takes just as long as if it was being explored with a conquistador. When the move completes, the army either enters the province, or discovers that movement is blocked and stops moving; either way, the province is revealed. Conquistadors with high army tradition have a chance to discover adjacent provinces. Undiscovered land provinces have a chance per month to be discovered by owners of adjacent provinces (typically taking 3–5 years). Russia, colonial nations, and potentially custom nations have national ideas that make this discovery instant. Any country that owns provinces undiscovered by the original country discovered the capital province of the original country at least 30 years ago. Any neighbouring country, in the same culture or religious group as the original country, explored a province at least 75 years ago. As well, exploration can now be accomplished via the diplomatic action to Share Maps, which will reveal entire regions to the requesting nation at the cost of prestige if the nation being asked to Share Maps has already explored that region, and the nation requesting the maps has units in an adjacent region. Additionally, the diplomatic action Steal Maps can be used to reveal regions in the same manner, but without the prestige cost. An army (of any size) led by a conquistador can be moved into land provinces covered by terra incognita, thus discovering them. If that land is owned by another country, the conquistador will merely discover the province when movement finishes instead of actually moving into it, unless that country grants military access. Conquistadors can move through primitive nations (those in New World technology groups that have not yet reformed their governments/religions) even without access. A fleet (of any size) led by an explorer can be moved into sea zones covered by terra incognita, thus discovering them. Upon entering a sea zone, they also have a chance to discover coastal provinces adjacent in that zone (increased by the explorer's Maneuver skill). Having a ship patrol back and forth will eventually reveal all coastal provinces (typically in 6–12 months). Ships take attrition as normal while exploring; fleet basing agreements can, therefore, extend a nation's effective exploration range. Land exploration largely follows the same process as it does without El Dorado, as listed above. If the country's own capital is not in a colonial region, an army (of any size) led by a conquistador in a colonial region can be sent on a mission to Hunt for the Seven Cities of Gold via the army interface. The army will then automatically move through terra incognita in the region, uncovering it as it moves, with a chance to trigger various special events. Exploring provinces owned by primitives, whether using Hunt for the Seven Cities or not, does not require military access. Any fleet led by an explorer and containing at least 3 light and/or heavy ships can be sent on an exploration mission via the fleet interface and will do so automatically once assigned. The fleet can be sent to explore 'the waters' of a region, meaning the explorer will discover open sea and coastal sea zones, but will not discover land provinces; or they can be sent to explore 'the coast' of a region, meaning the explorer will explore and reveal coastal land provinces in that region. Typically, 'the waters' of a region must be explored first before 'the coast' becomes available as a mission. While exploring open sea, the explorer will discover all sea zones in that region that are in range before returning. While exploring a coastal sea zone, they will discover all coastal provinces bordering that sea region before returning. Right-clicking on unexplored ocean will automatically start the exploration mission for the appropriate region, as long as part of it is within range. Fleets on exploration missions do not suffer attrition, but only missions to regions within their country's colonial range can be explored this way. Fleets on exploration missions cannot be recalled or reassigned during the mission, only disbanded, which may kill the explorer. Explorers may trigger certain random events while on missions. If the explorer dies, the fleet will automatically return home but will take attrition while doing so. An explorer can also be sent to circumnavigate the globe. The fleet will take sea attrition as normal while on this mission, and may sink, killing the explorer as well. Like other exploration missions, fleets sent on missions to circumnavigate the globe cannot be recalled or reassigned during the mission; ample preparation beforehand is advised before beginning the mission. The first nation worldwide to have an explorer successfully circumnavigate the globe receives +100 prestige. Any other nation that completes this mission afterwards receives +10 prestige. This exploration mission can only be completed once per nation, though it can be repeated if failed. While on exploration mission random Exploration events can trigger. A colonist envoy is required to start a colony. Nizhny Novgorod idea 5: To The East! Mayan, Inti, and Nahuatl countries passing a religious reform may select a colonist as one of the five options. Selecting the Clan Migration Native idea, for nations with a Native Council government, also provides a colonist. Parliaments also may pass a bill granting an extra colonist for 10 years. Available only with the The Cossacks DLC enabled. Native policies allow a nation to decide on their foreign policy regarding indigenous natives in colonizable provinces around the world. A native policy must be chosen when a nation unlocks their first colonist (from any source). The original selection is free. Changing native policies afterwards costs −1 stability, but has no cooldown. Native Coexistence Policy grants a −100% bonus to the chance to get a native uprising, effectively reducing aggressiveness in all colonizable provinces to 0. This policy is beneficial for when a nation's armies are busy elsewhere and can't be wasted sitting on a colony, when manpower is too precarious for constant skirmishes, when a nation is too poor to maintain a garrison, or for native and Sub-Saharan nations who may actually lose battles with natives in the early game. This policy also prevents natives from attacking exploring armies led by conquistadors, negating the need to field more than one unit in an exploring army or spend ducats on maintenance for said army. 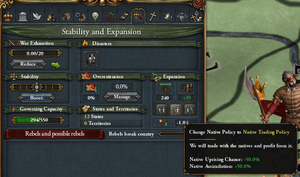 Native Trading Policy grants a −50% bonus to native uprising chance (effectively reducing aggressiveness by half) and +50% to native assimilation. Native assimilation means that the goods produced in a colonized province will increase by a factor equal to , rounded down, once that colony becomes a full province. The native trading policy increases this bonus by +50%. This choice could be useful if playing France, which also has a bonus to native assimilation in their national ideas (and also receives a reduction to native uprising chance that makes it a more advantageous Native Coexistence Policy), or for any nation that can handle a few revolts and will be coring and taking full control of the province when completed, or any nation controlling a significant percentage of the generated trade value. Native Repression Policy grants a bonus +20 global settler increase. While this policy makes for more rapid early colonization, the bonus is not overwhelming at higher technology levels. The provinces will require garrisons as native uprising chance is not reduced. The range from which a nation can establish a colony from a core is called the colonial range. It is measured from that nation's nearest core province, and it expands depending on the diplomatic technology level of the nation as well as events, advisers, missions, policies, ideas, and other bonuses. Fleet basing rights from third countries do not extend this range. This range also controls how far Explorers can go on exploration missions. If a nation has no ports, they can only colonize adjacent land provinces, regardless of colonial range. To check the range to a given province, change the map mode to "Colonial Range", and hover over the province of interest. The map will show green for in range and red for out of range. The Navigator Diplomatic Advisor gives a +20% colonial range bonus. The speed at which a nation's colonists travel to claim and establish colonial territory is related to the travel time of Merchants and Diplomats. It is based primarily on distance from the capital but, unless the target province is directly land connected to the capital, colonists travel by sea. The actual route taken is the shortest sea distance from either the capital's port (or, if it is inland, a port that is directly connected to it) to either the target province's future port location or the port that is closest to the target province. Example: Portugal's capital is Lisboa. In order to colonize Pipil (839), a province next to the Mayan nation of Kiche on the west coast of Central America, a colonist would first travel all the way south to Cape Horn in South America, then back north to reach Central America again. However, if Portugal colonized Chortli (2637) first, which is the province north of Pipil but on the east coast of Central America, then a Colonist subsequently travelling to Pipil would have its travel time dramatically reduced. Colonist travel time can be difficult to predict due to their coded preferences for travel. For port provinces not directly connected to one's capital, colonists will always travel by sea to where the port will be located, even if it would be faster to travel overland from another port (or the province borders both coasts like in Central America). For inland provinces not directly connected to the capital, colonists always travel to the closest non-blockaded port to the target province even if it would be quicker to travel cross country from a port on a different coast. These unusual rules can sometimes account for extended colonist travel time. Nations in colonial regions, especially North America, can experience unusually long travel times for colonists. Normally, this is because if a nation's capital is coastal, colonists will always prefer to travel by sea, even if travelling by land would be faster. It may be prudent to move the capital inland if this becomes an issue. Colonists travel across open sea much faster than through land or coastal sea provinces. For example, European colonists can reach the Caribbean faster than Sub-Saharan West Africa, even though it is physically much farther away. Colonist travel time is a fixed value based on the rules explained above; no events or ideas modify it. Colonists return instantly the day after either the colony becomes a city or they are recalled. As soon as any nation chooses to send a colonist to a province, no other nation can send a colonist to that province unless the colony is later destroyed before completion, even if the colonist will actually arrive two years later. Two nations cannot 'race' and see which colonist will arrive first to the province. Once a colonist arrives in an unowned province the population starts at 10. Colony populations grow at a base rate depending on the nation's global settler increase value, which is largely dependent on diplomatic technology level but also by some ideas and other modifiers. In addition, as long as a colonist remains in a colony, they have a chance each month (modified by colonist chance) of bringing in 25 additional population, speeding growth greatly. Once a colony reaches a population of 400, it will be randomly assigned a trade good based on a weighted list of goods available in that geographical region. This list can be seen via hovering over the large question mark icon in the uncolonized province screen. A colony becomes a full city when its population reaches 1000, and is destroyed if its population reaches 0; this can happen due to attacks by natives, events and colonies being destroyed by other countries in a war. Resending a colonist is required to restart these colonies. Colonists can be sent and recalled to other colonies in progress as many times as is warranted. Colonists can even be sent to colonies of enemy nations that have been seized by using the “Seize Colony” army option (which costs 5 military power). A captured colony retains the culture and religion of its original owner but is instantly converted to those of its new owner once a colonist arrives. There are a few policies that can increase the chance of new settlers. The location and climate of a potential colony will affect the rate of growth of the colony. Colonies in Arid, Tropical or Arctic locations will receive a −10 global settler increase penalty, and a colony with no adjacent colonies of that nation will receive a further −5 penalty. If controlling an area ahead of other colonizers is a concern, a nation can prefer to colonize locations with favorable terrain, but other major factors such as the number of hostile natives and the presence of a Center of Trade need to be considered as well. Some nations that were historical colonizers, notably Spain and Portugal, have unique missions or events that will improve settler growth. Available only with the El Dorado DLC enabled. With El Dorado DLC, the first Catholic nation to form a Colonial Nation (that is, to core 5 provinces in a colonial region) while the Papal State's opinion of them is positive will be assigned that region. That nation and their associated colonial nation will receive a +10 increase to settler growth within the region. A single nation can have any number of colonial regions assigned to them by the Pope. If another Catholic nation colonises a province in that region, they will receive a severe penalty for "Violated the Treaty of Tordesillas". These include a −20 Local Settler Increase penalty when colonizing that colonial region, as well as a −10 yearly papal influence penalty and a −50 modifier to the Papal State's opinion of that nation. Colonies that are in progress when the Pope assigns a colonial region to another nation do not count as having violated the Treaty of Tordesillas, only colonies started after a colonial region has been assigned. These modifiers can only affect Catholic nations; nations of other religions can receive neither the bonuses nor the penalties. If the nation owning a colonial region is completely annexed, the colonial region will revert to no nation having a colonial claim, and a new nation can be assigned the region by creating a colonial nation or owning a current colonial nation in the region. The Treaty of Tordesillas mechanic attempts to represent the historical treaty made between Portugal and Spain which assigned lands east or west of a certain longitude to Portugal or Spain, respectively. With The Cossacks expansion, a nation must select a Native Policy that represents how that nation will interact with native peoples around the world. This only refers to the uncivilized indigenous native populations in uncolonized provinces, not to any Native American, African or Indonesian nations. If a nation selects Repression, they will receive a bonus +20 global settler increase, at the cost of more uprisings by the natives. The other two policies do not affect settler increase. Without The Cossacks, when a Christian state establishes a colony in the New World with at least 300 natives, it triggers the “Natives Encountering our Colonies” event. All three options enable events that can lead to temporary boosts to global settler increase and colonist chance, and will unlock other events related to the decision chosen. Non-Christian nations cannot receive any of these events. Note that unlike force limit, this is applied to each colony individually in the order that they were founded, so the more recent colonies will be saddled with the higher cost multipliers. Colonizable provinces are usually occupied by natives, who may attack a colony there, depending on several factors. Natives are also very likely to attack land units passing through their province, regardless of whether the province is colonized. However, these attacks depend on Aggressiveness, so taking the “Coexistence” Native Policy disables these random attacks and taking the “Trading” Native Policy reduces the chance of an attack occurring by half. This can be very important for North or South American natives who may have to cross uncolonized territory to attack a war target, especially since North or South American Native nations begin at Military Technology 1 and so can actually lose battles, or at least significant amounts of manpower, in battles with the local native population in a province. This image may contain outdated information that is inaccurate for the current version of the game. The last version it was verified as up to date for was 1.23. The size of the native population determines how many native regiments attack at a time. The native population in a province can be reduced permanently using the Attack Natives military action, which costs a small amount of military power proportional to the population, aggressiveness, and ferocity of the natives. The action may need to be performed multiple times in order to completely drive out the local population, as native regiments that break from combat due to low morale are not killed and so return to the 'population' of the colony. So a colony with 1400 natives in the province should gain goods produced when the colony completes. A population of 4000 natives would give +0.2 goods produced, equivalent to one level of production development. Because of this, it is usually beneficial to leave the native population alone if the colony can be protected by an army. Taking the Native Trading Policy increases the assimilation bonus by +50%, effectively increasing the goods produced in the completed colony by half of what it normally would have been due to native population. So a colony with 1400 natives in the province would gain 0.105 goods produced when the colony completes (e.g., ). The British mission “Colonize the Caribbean” gives +25% native assimilation for 15 years. When colonizing a province there is a chance for the native population to rise up aggressively in an attempt to destroy the colony and expel the foreign invaders. If a native uprising happens, native regiments equal to the native population in the province (rounded to the nearest thousand) will appear and attack any military units in the province, or begin a siege of the province if there are no military units stationed in it. If the siege is finished (which will take one month), the settler population in the colony is reduced by −100 per regiment of natives, which can destroy the colony completely. After the siege is finished the native regiments will disband, regardless of whether or not the colony survived. After an uprising (whether successful or not), there is a one-year cool-down period during which there is no chance of another native uprising from the province. After this period the chance of an uprising returns to what it was before. Aggressiveness ranges from 0 to 10 and determines how likely the natives are to attack a colony. Each point of aggressiveness gives a 1% chance of a native uprising happening per month. Taking the Native Trading Policy adds −50% to the chance of uprising, effectively halving aggressiveness. Taking the Native Coexistence Policy will add −100% to the chance of uprising, effectively removing native aggressiveness and the chance of an uprising in all provinces. Ferocity ranges from 0 to 10 and is independent of aggressiveness. Natives regiments in the province get a +5% damage bonus per point of ferocity. This does not affect the number of settlers killed by a successful uprising. During a war, a colony can be occupied like any province. The development of a colony through normal growth will continue unabated, but a Colonist present in the province will be sent back to the colony's owner. An army standing in an occupied colony will have the option to Seize Colony for 25 military points. The colony ownership will transfer to the nation that used the action. The colony will keep the culture and religion of the previous owner until a colonist from the new owner reaches the colony. The colony will cost its new owner money the same as if it had been colonized by them, including the increasing costs of holding more colonies than the number of colonists. An alternative option is the Military Action Burn Colony for 5 military points. The colony is completely destroyed and the province becomes, once again, an uncolonized province. Since a colony keeps growing under occupation, it is possible that it will become a full colonial province while being occupied. Unless the 'Seize Colony' option was used earlier, the 'finished' province will belong to the original owner. Once colonization is finished, a colony becomes a full-fledged province. A newly colonized province will be part of a territory until the owner chooses to upgrade that territory into a state. This means that the minimum autonomy in the province will be 75%. The province will not be considered for the calculation of parliament seats or estates percentage of controlled land. However, the owner will still be able to build buildings, recruit troops, build ships, and improve the province's development level, and the nation will now be able to trace coring and colonial range from this province. If the area is made into a state, the colony will become, for all intents and purposes, a regular province. The autonomy floor will be 0%, and the province can also be assigned to an estate or given a parliament seat. Both of these groups will count the province as part of the nation's total development for percentage of controlled land. If the finished colony is in a colonial region, the colonizing nation will retain control of the province until a total of 5 provinces are colonized (or conquered and cored) by that nation in the same colonial region. All provinces will then be ceded to a newly formed colonial nation, with the last province colonized becoming capital). Any further provinces that are conquered (even if not cored) or colonized in that colonial region will be ceded to the colonial nation after one day. Provinces colonized in a Colonial Region by a nation will receive the same religion and culture as the parent nation, as will colonies in Trade Company Regions that have no native population. Provinces in Trade Company Regions are an exception; these provinces will keep their religion and culture unless the the native population was zero to start, or was removed by Attack natives action. If so then sending or resending a colonist will turn the culture and religion to the same as the colonizer. Colonized provinces do not cause overextension in the parent nation, even if left un-cored. This applies even if the parent nation conquered land from another nation that had previously colonized it; as long as the province had ever been a colony in the past, it will cause no overextension, though it may still have unrest. Colonial Nations and Trade Companies are specialized Subject Nations that can be formed via Colonization (or conquest of the appropriate regions). Understanding both types of colonial subject nations is key to benefitting from the Colonization process. Using Colonial Nations or Trade Companies to produce and control Trade Value in nodes, as well as utilizing them to gain free Merchants or military control of overseas territories, are some of the benefits these subjects can provide a parent nation. With El Dorado, using a conquistador to explore terra incognita in a colonial region will sometimes trigger events based upon the search (and sometimes discovery!) of mythical locations in the New World. These events can provide monarch points, ducats or prestige and add flavor and occasionally material benefit to the exploration of the New World. Available only with the Third Rome DLC enabled. The Third Rome DLC unlocks a unique colonization system for Russia to model its rapid expansion into Siberia. Once a united Russia unlocks its second national idea, it may establish a Siberian Frontier colony in any empty province with a direct land connection to its capital passing through non-colony provinces. Establishing a frontier costs 20 diplomatic points. Frontier provinces do not count towards the colony limit or require monthly maintenance. They grow at a varying rate of +5 - 15 settlers per month, but since as many Siberian Frontiers as possible can be established at the same time, Russia can reach the Pacific Ocean fairly quickly. ↑ See in /Europa Universalis IV/common/static_modifiers/00_static_modifiers.txt (Static_modifiers#Colony level). ↑ See in /Europa Universalis IV/common/static_modifiers/00_static_modifiers.txt (Static_modifiers#Production efficiency). ↑ See in /Europa Universalis IV/common/static_modifiers/00_static_modifiers.txt (Static_modifiers#Native aggressiveness). This page was last edited on 15 April 2019, at 21:22.